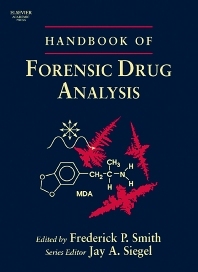 This Handbook discusses various forms of the drug as well as the origin and nature of samples. It explains how to perform various tests, the use of best practices, and the analysis of results. Numerous forensic and chemical analytic techniques are covered including immunoassay, gas chromatography, and mass spectrometry. Topics range from the use of immunoassay technologies for drugs-of-abuse testing, to methods of forensic analysis for cannabis, hallucinogens, cocaine, opioids, and amphetamine. The book also looks at synthetic methods and law enforcement concerns regarding the manufacture of illicit drugs, with an emphasis on clandestine methamphetamine production. This Handbook should serve as a widely used reference for forensic scientists, toxicologists, pharmacologists, drug companies, and professionals working in toxicology testing labs, libraries, and poison control centers. It may also be used by chemists, physicians and those in legal and regulatory professions, and students of graduate courses in forensic science. Forensic scientists; toxicologists; pharmacologists; drug companies; toxicology testing labs; libraries; poison control centers; physicians; legal and regulatory professions, and chemists. University of Alabama - Birmingham, AL, U.S.A.
"The editor and authors have done a fine job of providing up-to-date information on analytical techniques, instrumentation and methods for the drugs most commonly seen in forensic drug laboratories.